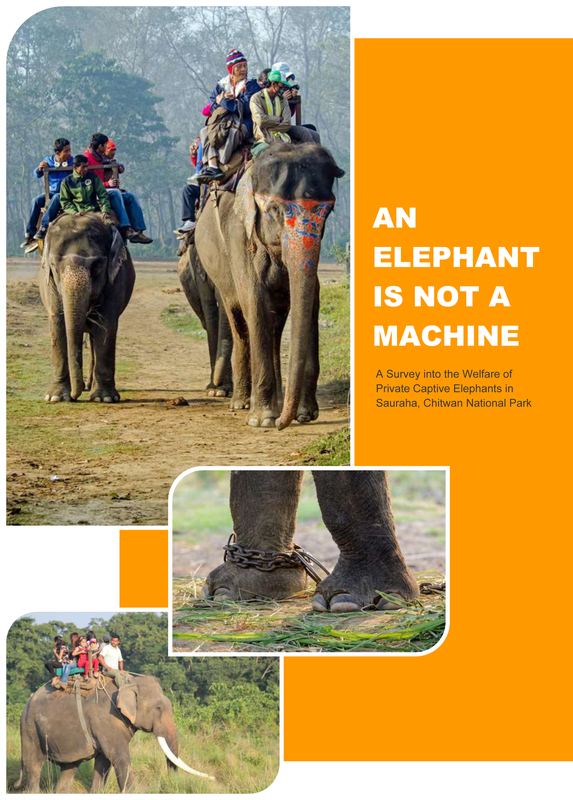 EWN offers kudos to Animal Nepal for publishing An Elephant Is Not A Machine, a report on the welfare conditions of safari elephants in Sauraha, Chitwan. The survey of 42 privately owned ‘safari elephant’ in Sauraha learns that their welfare is ‘greatly compromised’. According to the report, only 18% of elephants live under ‘Improving Conditions’ while 82% of elephants have to cope with ‘Unsuitable Conditions’. Not a single elephant qualifies for ‘Excellent Conditions’. Welfare conditions fall short in many areas including freedom of movement, shelter conditions, nutrition, health and healthcare, safari management, as well as mahout welfare. Chris Pitt, Campaigns Manager for Care for the Wild International, says the research is vital to improve conditions of safari elephants in Chitwan. “We conducted the survey after receiving many complaints from tourists and observing the deteriorating conditions in Chitwan first hand,” says researcher Lucia de Vries. She says the acute suffering of elephants needs to be addressed urgently. “In order to save human and elephant lives, and to improve the image of the tourism industry, authorities and elephant owners should cooperate to improve safari management,” according to the researcher. The conditions of Sauraha’s safari elephants seem to go largely unmonitored by authorities and tourism associations. Among the 42 surveyed elephants four are fully blind, two are under-aged and eight suffer from Tuberculosis, yet work full time. Some are over 60 years old yet in the absence of retirement facilities work full time. Elephant safaris have become controversial with increased criticism from welfare organisations and responsible tourism companies. According to Pitt from Care for the Wild International, the elephant trekking industry needs to be regulated so that conditions improve, both for the elephants and the mahouts. “In order to do that properly, we need to understand exactly how the industry works, which is why Animal Nepal’s research is absolutely vital. This study can inform change which can help elephant trekking improve itself for the good of the industry, the mahouts, and particularly the elephants,” says Pitt. One of the main findings of the report shows the direct correlation between the welfare of elephant and that of mahouts. Elephants whose mahouts are well taken care off are generally healthier. With a few exceptions the outcomes show that mahouts of elephants who score lowly in terms of Elephant Welfare face issues such as insufficient income, inappropriate housing or other issues. Another important finding is that elephants housed together with and are in close proximity of elephants they like are likely to be healthier. Hobbles and ropes used for the fitting can cause wounds, tissue damage and in the worst case even spinal injury. All these can be observed in Sauraha’s elephants, of which 24 % suffers from wounds, and one from spinal injury. Considering the high presence of beatings, there appears to be an urgent need for elephant owners and mahouts to study and practice humane control management and to replace beatings and injuries with positive reinforcement. Generally elephant owners show a surprising lack of knowledge of elephant behavior and management. 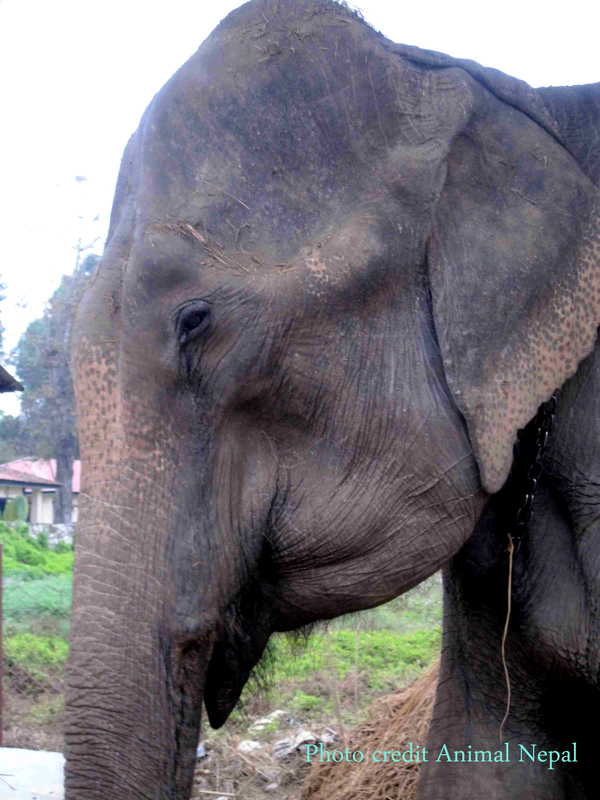 In turn mahouts tend to hold on to outdated beliefs about elephant control and management. Exposure and training will address these issues and prepare owners and caretakers for scientific, humane and professional elephant management. With the present unregulated safari management, the safety of customers, caretakers and public at large is at risk. Immediate interventions are needed to improve safety and general management standards. Improved legislation and detailed welfare standards and guidelines are needed to provide a framework for better safari elephant management, says the report, which can be downloaded here. I road elephant from Napal into India maybe thirty years ago now. I didn’t realize that it was unregulated; but, I do believe that both elephant and mahout lived better with me than without. No, you are not absorbing the information regarding the injuries that elephants suffer when carrying the seats and riders of tourism. Not only flesh wounds, and SPINAL INJURIES, BUT MANY OTHERS, and the subsequent infections as well as overwork. 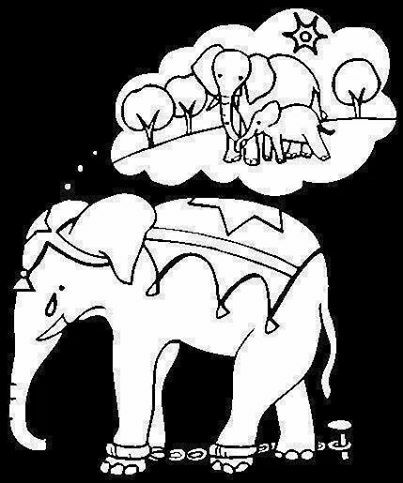 THERE ARE OTHER WAYS TO SUPPORT ELEPHANTS AND MAHOUTS WITHOUT RIDING THEM. You write as though it is riding or nothing, but that’s absolutely not true. In Thailand, NW of Chiang Mai, is The Elephant Nature Park, where tourists pay to come feed and hang out with the elephants, to bathe them in the river, to walk with them and visit with them, to help the private park with what needs to be done. This way, the elephants are NEVER on chains or hit or ridden, they are VERY HAPPY and it’s easy to see it in their expressive faces, and they’re healthier as well. Their mahouts make money, accompany them everywhere they go by foot, not riding them, and, both of them safe and cared for. It’s GREAT TOURISM. This is what is needed. Their spines are NOT made to carry heavy loads. They should not be ridden, and that’s a damaging way for the mahout to make money. Help them make money the healthy way, the happy way, the safe way, WITHOUT injuries and suffering. BE PART OF THE SOLUTION, NOT PART OF THE PROBLEM. Tourism needs to be ethical and responsible; it cannot be to the expense of natureand the creatures. Man does Not have a license to mis- use.